If further evidence were needed that Kellie is slowly developing her Geek Gland, she has been playing more and more RPG-style games, mainly of late, Dragon Age: Origins. Now, me personally, I don't play RPGs on consoles... I'm much happier with a mouse & keyboard and a plethora of keys and commands, while Kellie, starting out in the world, is happier with a controller and a radial-menu of commands. The point of this post? Well, I'm pretty sure quite a few of you are techno-sorts, into your PS3s and all that milarky. Kellie is having an issue with her DA crashing - rather, freezing up. The PS3 works fine, but DA seems to have a few "issues" with working. 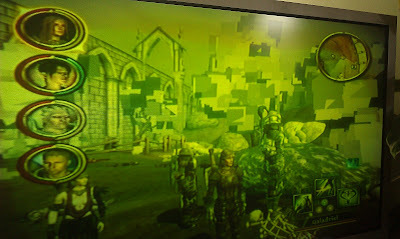 It can run fine for hours and days at a time, then for no reason, the graphics will go from "Ah pretty" to blocky boxes. More recently, however, the game itself freezes and stays frozen. The music keeps playing, but that's all, and you have to power off the Playstation with the mains switch. Now, were this a PC, I'd check drivers, change the settings and what have you for graphics, but being a PS3, I'm kinda stuck. I'm partly inclined to think it's a heat issue. The PS3 did seem rather warm after each crash, but even letting it cool between sessions hasn't fixed it. Yesterday, I used the tried and tested method of wedging a house fan up against the vents to blow cool air inside it, and that DID seem to fix it. So, if anyone has any suggestions or advice, please let me know!! Yes, I know that looks green/yellow. It's not, I promise!